Polio is still a threat in some developing countries, where it can be hard to keep the vaccine cold. Research into freeze-dried vaccines might help. There hasn’t been a case of polio in the United States in 39 years, but the virus is still a threat in a few developing countries — at least for now. 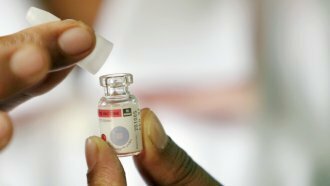 A newly developed vaccine could eventually help wipe out polio for good. While the polio vaccine developed in the early 50's mostly eradicated the disease worldwide, it only works if it can be kept cold — and refrigeration can be limited in countries like Afghanistan and Pakistan, where polio is still a problem. Researchers at the University of Southern California tried different methods and ingredients until they found a combination that wasn't sensitive to temperature. They freeze-dried the vaccine into a powder, kept it at room temperature for four weeks and then rehydrated it. The new vaccine successfully protected against the polio virus when tested in mice. The vaccine still needs to be tested in humans, but if it works, it could help address the very few remaining Polio hotspots. There's been 27 cases to date in 2018, reported in places like Nigeria, Papua New Guinea, Syria and Pakistan.